PRECON Precast, LLC is the leader in per-engineered environmental products. Products are cataloged with standard features as shown on specification material. However, these products are often furnished to meet specific engineering requirements, and have special features and arrangements. In such cases, handling and installation procedures may vary slightly depending upon the actual type of construction. It is recommended that a company representative be consulted in each unique situation. Local codes and regulations should supersede all recommendations made by PRECON Precast, LLC and its representatives, and the appropriate authorities should be consulted before installation is made. Where an apparent conflict of code requirements and manufacturer recommendations or standard design exists, the assistance of a company representative should be requested. In almost every instance, PRECON Precast, LLC will be able to make modifications necessary to comply with local codes, jurisdictions and interpretations, if notified prior to actual fabrication or upon order placement. The customer or his contractor shall prepare the excavation to the proper depth using dimensional data and weights from approved submitted drawings. Call 817-448-9718 to confirm excavation dimensions and crane requirements. All excavations should be shored or stepped back in accordance to OSHA recommendations. A level base within the excavation and a minimum of twelve (12) inches of clearance on all sides of the unit is required. The depth of the base and the material shall meet the specifications and requirements for the type of soil at the setting location (consult with design engineer for base specifications). All field excavation and preparation is the sole responsibility of the customer/contractor. The delivery of the unit should be scheduled at least 48 hours in advance, weather permitting. To reschedule delivery, a 24 hour notice is required. Unit will be delivered and placed in the excavation by PRECON Precast, LLC or its representatives, when accessible for crane truck. The crane operator will perform rigging and setting the unit. It will be necessary for the customer/contractor to furnish the required labor to install the joint sealant and assist our crane operator with the installation. Back-fill is the sole responsibility of the owner/contractor. 1. With material excavated placed in (1) one foot lifts and compacted and tamped to original density or per owner/engineer’s requirements. 2. Bank sand in (2) two foot lifts and compacted or water-jetted per owner/engineer’s requirements. If project specifications require testing of tanks, use the following testing procedure. After completing the piping, the unit shall be properly back-filled. Fill the tank with water to the normal operating level. Record this level and let stand for 24 hours. Recheck the water level. A 5% or less variance is generally acceptable. 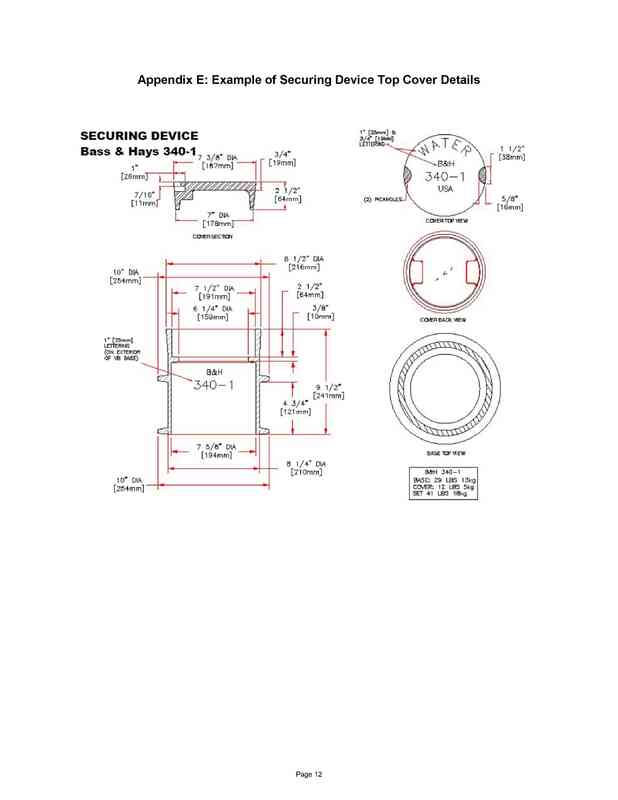 Note that precast concrete tanks are designed for below grade installation with an earthen back-fill. DO NOT fill tanks with water until the tanks are properly back-filled. Filling tanks prior to back-filling may cause abnormal stresses and may result in leakage and/or damage to the tanks and may void the manufacturer’s warranty. Precast Concrete Meter and Back Flow Vaults that are installed below ground level may be drained by installing a 6” pea gravel or sand bed under the vault. The sump opening in the vault bottom allows rainwater and condensate to percolate to the ground below. 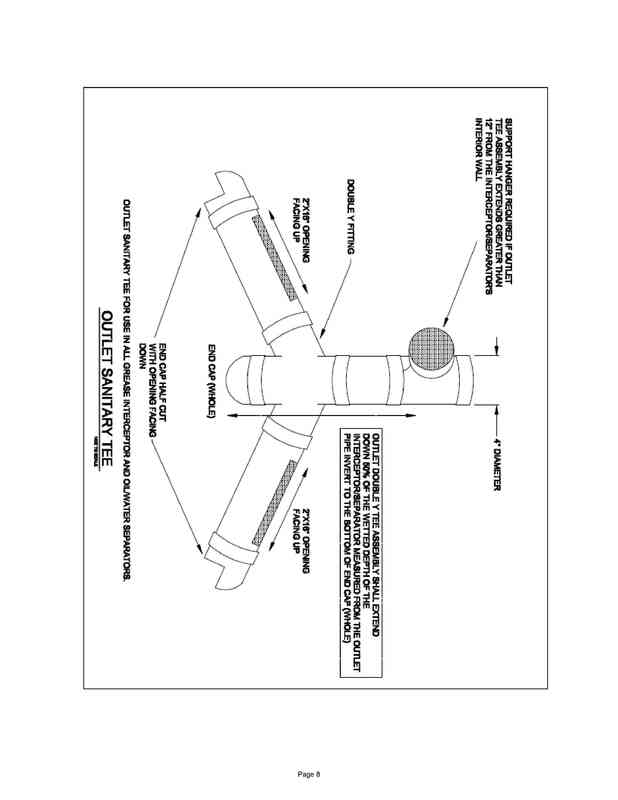 This will also prevent up-lift of vault in the event of a flood. Grease traps in Weatherford. Grease traps in DFW Airport. Sample wells in DFW Airport. A grease interceptor is a wastewater pretreatment device that holds or traps the grease, food solids, and oils discharged from a food service establishment prior to entering the sanitary sewer. Who must have a grease interceptor? 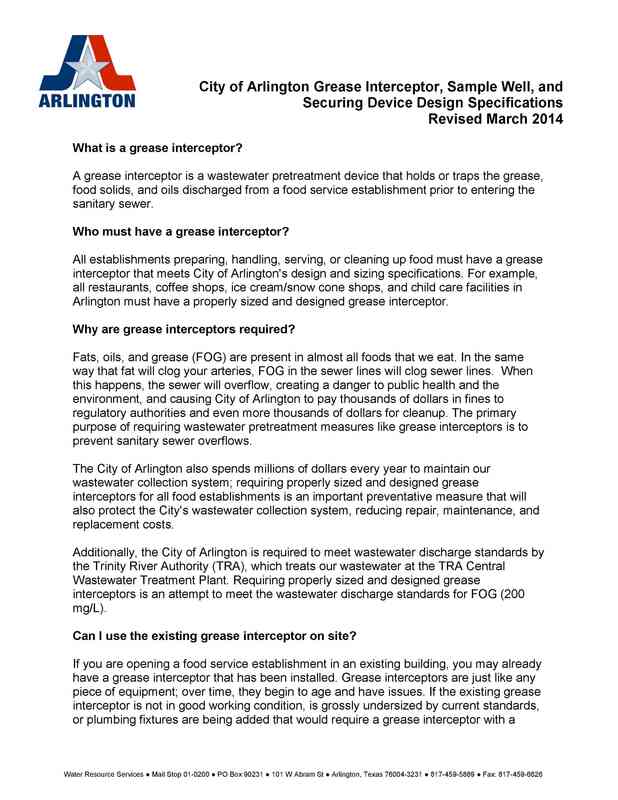 All establishments preparing, handling, serving, or cleaning up food must have a grease interceptor that meets City of Arlington’s design and sizing specifications. For example, all restaurants, coffee shops, ice cream/snow cone shops, and child care facilities in Arlington must have a properly sized and designed grease interceptor. Why are grease interceptors required? Fats, oils, and grease (FOG) are present in almost all foods that we eat. In the same way that fat will clog your arteries, FOG in the sewer lines will clog sewer lines. When this happens, the sewer will overflow, creating a danger to public health and the environment, and causing City of Arlington to pay thousands of dollars in fines to regulatory authorities and even more thousands of dollars for cleanup. The primary purpose of requiring wastewater pretreatment measures like grease interceptors is to prevent sanitary sewer overflows. The City of Arlington also spends millions of dollars every year to maintain our wastewater collection system; requiring properly sized and designed grease interceptors for all food establishments is an important preventative measure that will also protect the City’s wastewater collection system, reducing repair, maintenance, and replacement costs. Additionally, the City of Arlington is required to meet wastewater discharge standards by the Trinity River Authority (TRA), which treats our wastewater at the TRA Central Wastewater Treatment Plant. 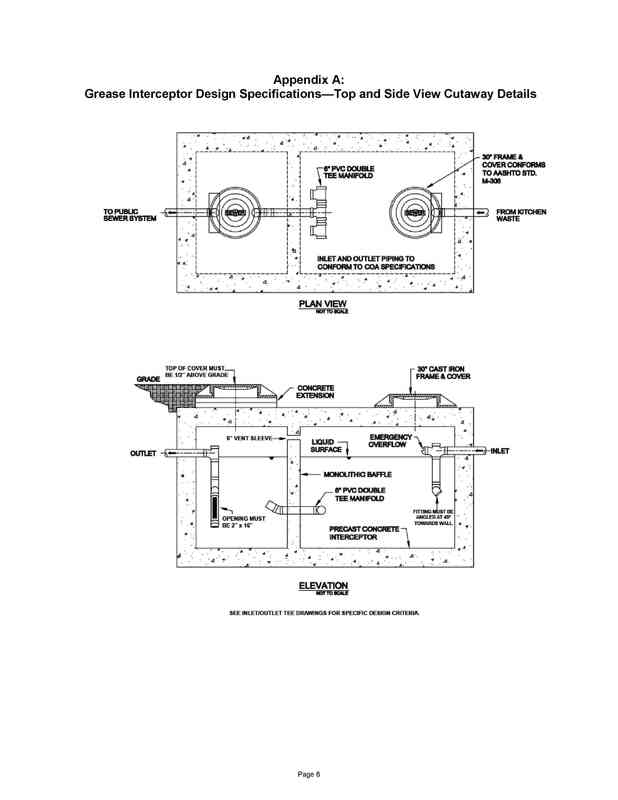 Requiring properly sized and designed grease interceptors is an attempt to meet the wastewater discharge standards for FOG (200 mg/L). Can I use the existing grease interceptor on site? 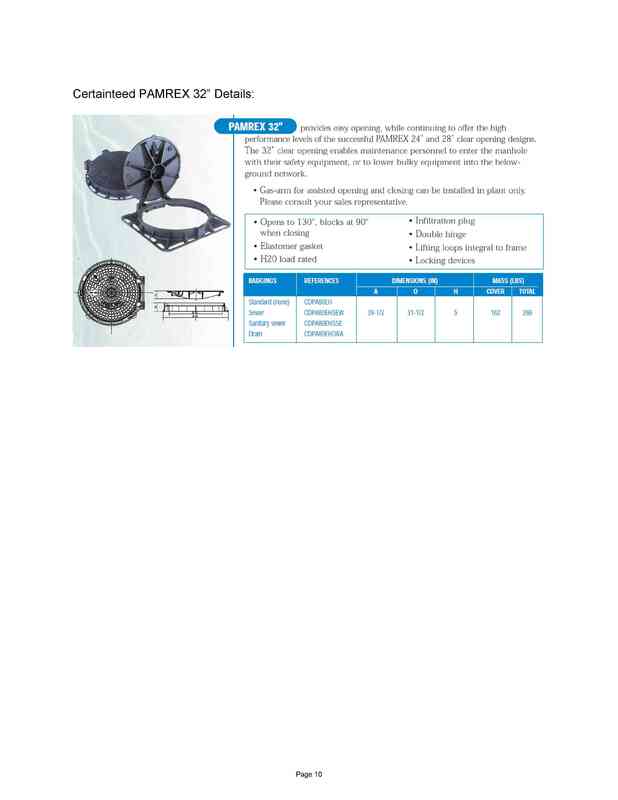 larger capacity to be installed, you may need to replace the existing grease interceptor. Contact Water Resource Services at 817-459-5902 to determine if you will be able to use the existing grease interceptor. What is a sample well and securing device? Food service establishments must install a sample well and securing device in addition to the grease interceptor. 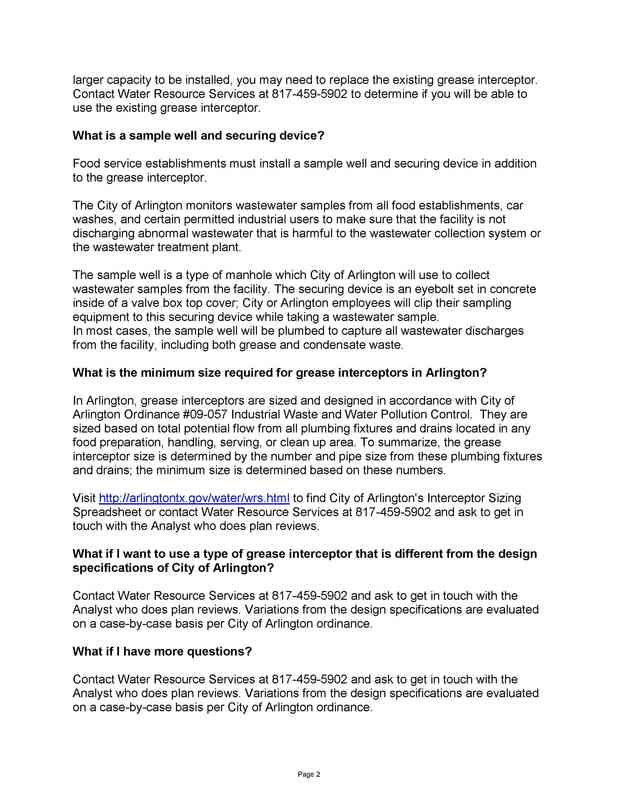 The City of Arlington monitors wastewater samples from all food establishments, car washes, and certain permitted industrial users to make sure that the facility is not discharging abnormal wastewater that is harmful to the wastewater collection system or the wastewater treatment plant. 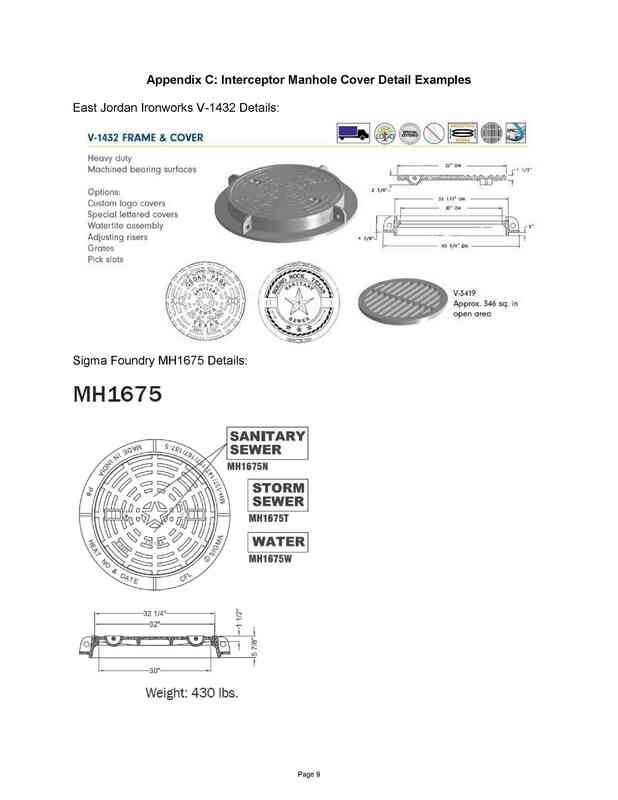 The sample well is a type of manhole which City of Arlington will use to collect wastewater samples from the facility. The securing device is an eyebolt set in concrete inside of a valve box top cover; City or Arlington employees will clip their sampling equipment to this securing device while taking a wastewater sample. In most cases, the sample well will be plumbed to capture all wastewater discharges from the facility, including both grease and condensate waste. 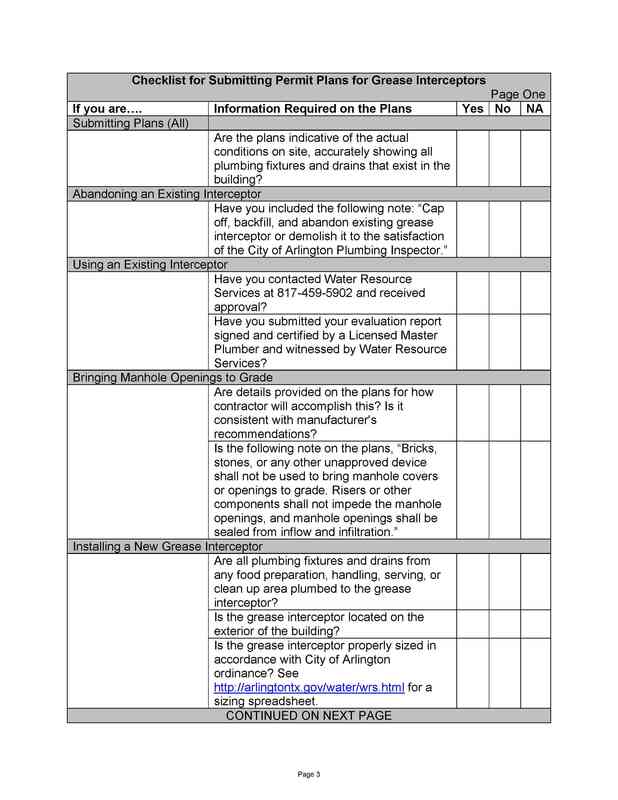 What is the minimum size required for grease interceptors in Arlington? 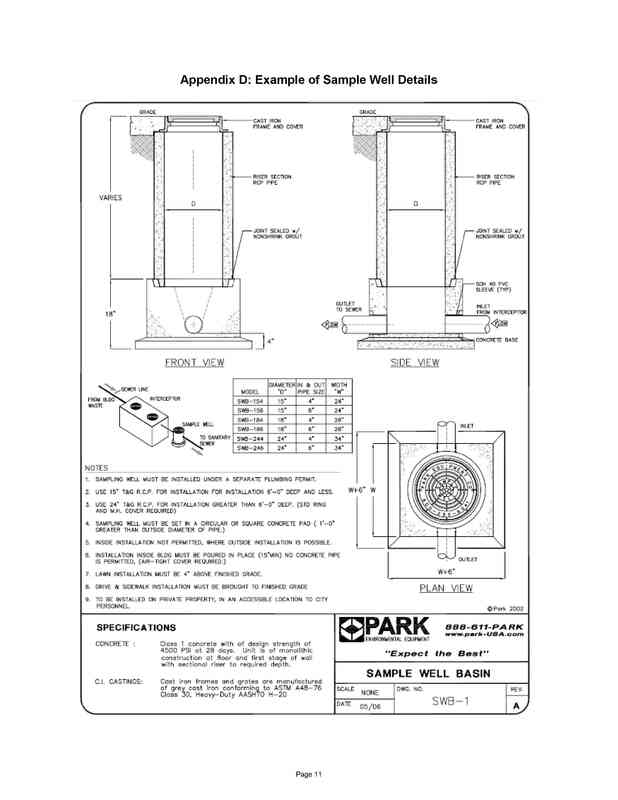 In Arlington, grease interceptors are sized and designed in accordance with City of Arlington Ordinance #09-057 Industrial Waste and Water Pollution Control. They are sized based on total potential flow from all plumbing fixtures and drains located in any food preparation, handling, serving, or clean up area. 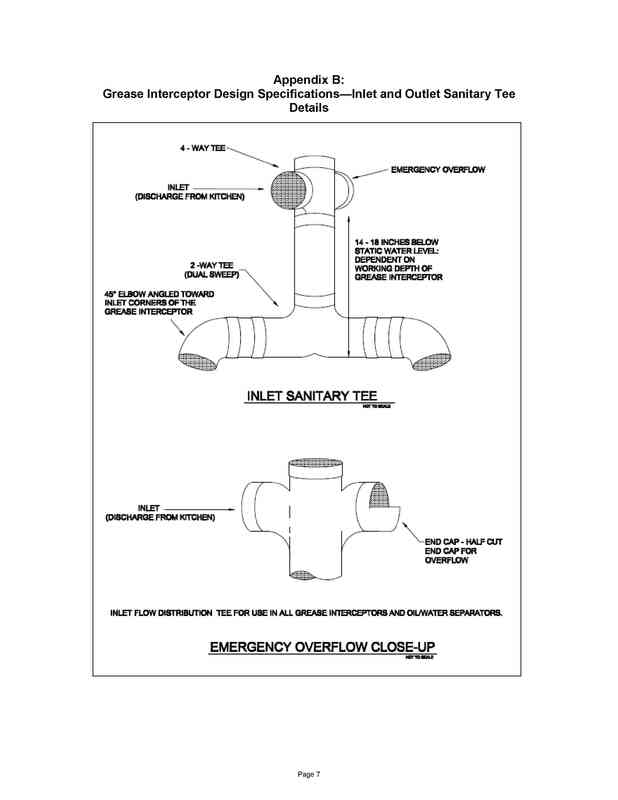 To summarize, the grease interceptor size is determined by the number and pipe size from these plumbing fixtures and drains; the minimum size is determined based on these numbers. 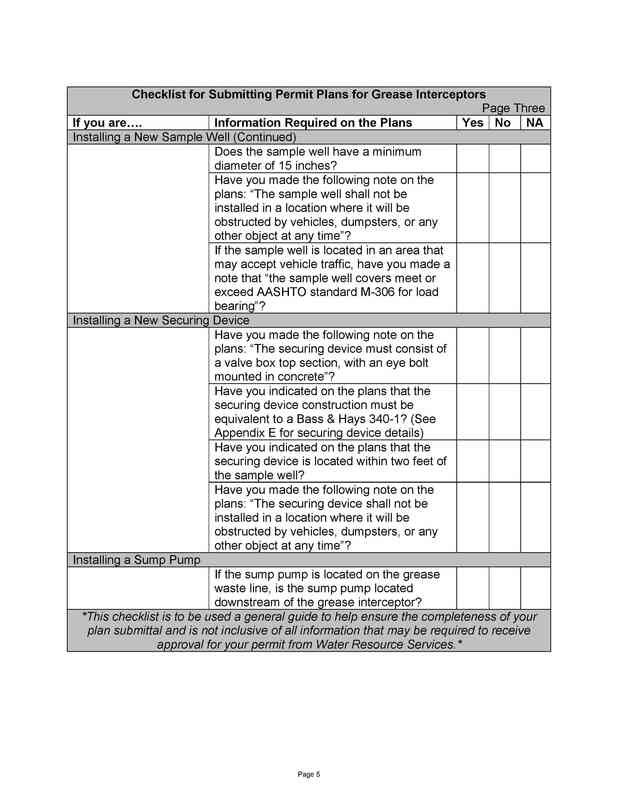 Visit http://arlingtontx.gov/water/wrs.html to find City of Arlington’s Interceptor Sizing Spreadsheet or contact Water Resource Services at 817-459-5902 and ask to get in touch with the Analyst who does plan reviews. 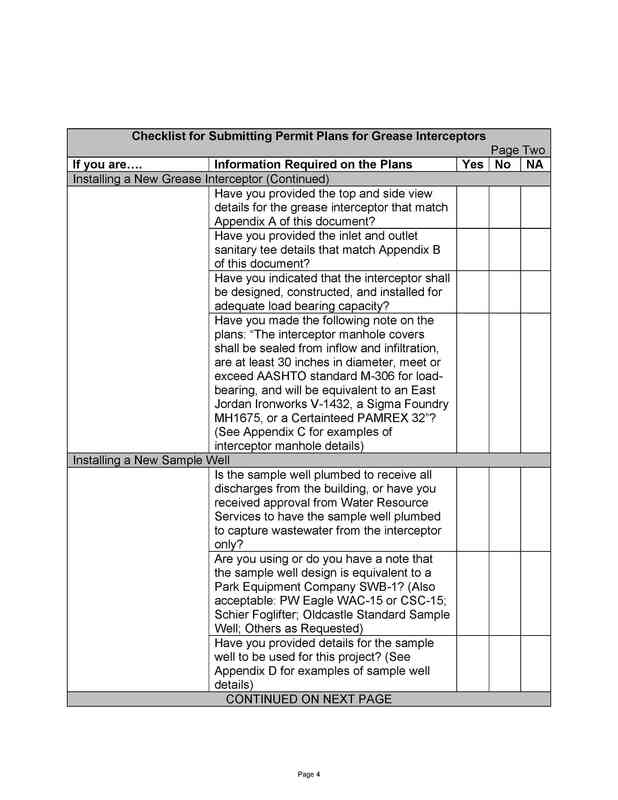 What if I want to use a type of grease interceptor that is different from the design specifications of City of Arlington? Contact Water Resource Services at 817-459-5902 and ask to get in touch with the Analyst who does plan reviews. Variations from the design specifications are evaluated on a case-by-case basis per City of Arlington ordinance. Copyright © 2019 Precon Precast, LLC - All Rights Reserved.